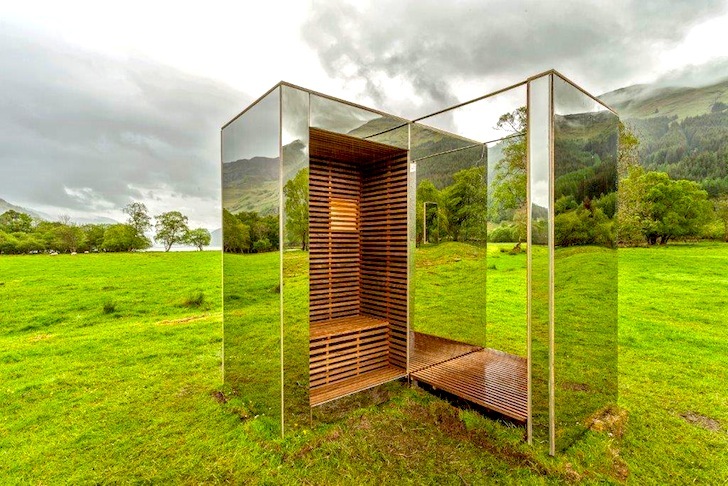 Architecture students Angus Ritchie and Daniel Tyler recently completed Lookout, a tiny mirrored structure created as part of the Scottish Scenic Routes initiative. 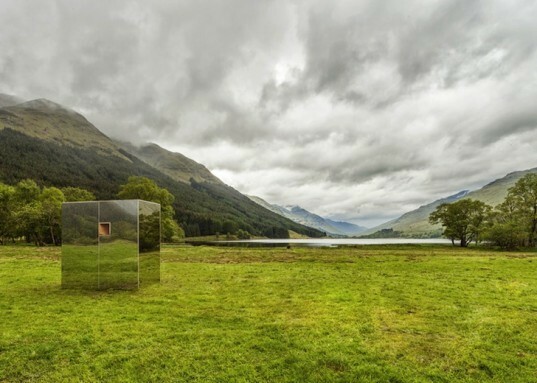 Located in Scotland's bucolic Loch Lomond and Trossachs National Park, the reflective building would be almost imperceptible were it not for the strategically placed wood-clad window and door openings. The design/build project was developed as part of Ritchie and Tyler's Advanced Architectural Design thesis at Glasgow's Strathclyde University. Built by hand, the Lookout consists of a timber frame structure that was fabricated offsite and then trucked into the National Park. Once on site, Ritchie and Tyler installed sheets of mirrored stainless steel laminated to birch ply. To minimize waste and building costs, the designers used standard sheet sizes that informed the final cuboid shape. To frame views up Loch Voil and Loch Doine, Ritchie and Tyler created cutouts in the structure for visitors to sit and stand in. Inspired by Japanese architecture, the carved out spaces are lined with slatted Frake Hardwood. Exposed and treated plywood edges frame views reflected in the mirrored panels. As this is a mirror and not a transparent sheet of glass, any approaching bird would see another bird flying directly at it. Given the low height of this structure and the placement in an open field, it also isn't likely to have birds flying through the space it occupies. The Lookout is located in Scotland's bucolic Loch Lomond and Trossachs National Park. Built by hand, the Lookout consists of a timber frame structure that was fabricated offsite and then trucked into the National Park. Once on site, Ritchie and Tyler installed sheets of mirrored stainless steel laminated to birch ply. To minimize waste and building costs, the designers used standard sheet sizes that informed the final cuboid shape. To frame views up Loch Voil and Loch Doine, Ritchie and Tyler created cutouts in the structure for visitors to sit and stand in. Inspired by Japanese architecture, the carved out spaces are lined with slatted Frake Hardwood.